In 1994, while camping in Mountain Wolf, California, Laura Sánchez Andrade experienced a spiritual awakening while connecting deeply with a circle of ancient oaks. As she hugged each one of them, she felt their healing energy going into her body to her heart. During this connection, she experienced her fears, sadness, anger, worries, and bitterness leaving her and being replaced with forgiveness, love, compassion, and happiness. Those trees welcomed her back home to Nature and Mother Earth. From that moment on, Laura knew she needed Nature for healing. 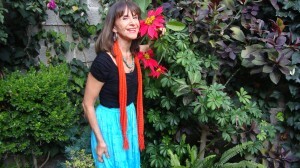 In 1996, she moved to Asheville, North Carolina, and there she deepened her spiritual connection with nature. After studying herbalism, she read Eliot Cowan’s book, Plant Spirit Medicine, and subsequently graduated from his Plant Spirit Medicine training in 2000. Laura is inducted as a Lay Spiritual Healer in the Temple of Sacred Fire Healing and practices Plant Spirit Medicine near her home in Puebla, Mexico. Working with her green friends – these magical beings of Nature – enriches her life because every time they touch a person, a miracle happens. She feels grateful and honored to work with their medicine.